I'm always amused by the international road signs that point the direction to airports in remote areas. Usually, they depict a silhouette of a jet and are supplemented by a small sign showing the name of the airfield in question. Mostly, the fields are essentially airstrips with a bit of tarmac, a wind sock and a small office, and maybe a snack bar or restaurant. One or two might have a long enough runway to serve as a last-chance landing spot for a smaller passenger jet, but nothing along the lines of an airbus. We saw one of these signs on our recent travels through mine country in the northwest portion of the state, and the accompanying name raised my enthusiasm level. "Greenwood Lake Airport!" I exclaimed. "That's where the first air mail was sent from!" Or something like that. Naturally, we had to check it out. Following the road signs, we found our way to a small airstrip with a couple dozen small planes tied down on the tarmac, plus a small restaurant and office which has a 'Rent a Wreck' banner up. Oh, and the fuselage and wings of a Lockheed Constellation emerging from the building. It looked promising, but we couldn't find any markers or signs telling the story. Perhaps someone inside would know. Well, I was wrong on both counts, as we found out from an employee inside, and from subsequent research. It wasn't the first airmail, nor was it from the airport itself. Rather, it was in 1936 that a stamp collector and American Rocket Society member named F.W. Kessler combined his passions to form the Rocket Airplane Corporation of America. He wanted to fly mail from New York into New Jersey by rocket plane, and he chose to attempt it from the shores of Greenwood Lake. While he found a way to sell inflated postage for 6000 letters to cover the cost of his experiment, it didn't quite work. Instead, the rocket tore the plane's wings loose before it reached its intended destination. As one observer was heard to say, "a husky man could have heaved that ship across the state line." According to the airport employee, photos and the story of the launch are preserved at the West Milford A&P; we checked later and couldn't find the store, let alone the photos. 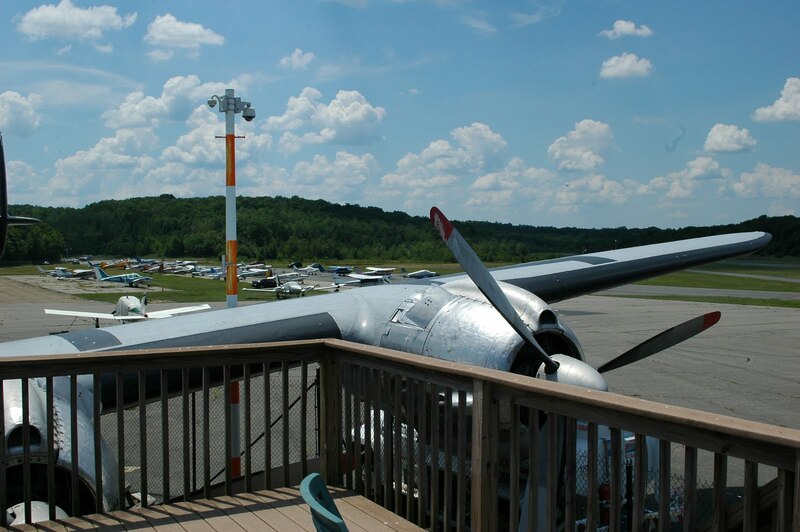 That's not to say there's nothing of interest at Greenwood Lake Airport. The partial Lockheed is open and available for a quick view. While they've taken the seats out in favor of high-top cocktail tables, the airport has installed several informative signs that relate the history of the Constellation model, including its storied history as Eisenhower's plane of choice. The cockpit is also still intact, complete with pilots' jackets draped across the seat backs. You can also step outside the forward door to a deck overlooking the runway, which could be a lot of fun if pilots are practicing their touch-and-gos. 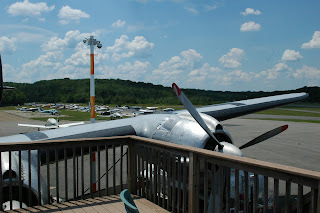 According to their website, the airport will also host an airshow in late August, complete with World War II historians and 40's-era reenactors. No word on whether anyone will try to recreate the rocket mail experiment, but for airplane enthusiasts, it could be a lot of fun. Watching the documentary right now. Astounding, even after just 10 minutes. I was there when the plane landed. What a sight. It took a lot of taxiway maneuvering to get the Constellation to it's resting place. It was winter and we froze.